june 22, 2015 Tornado Warning: Huron Perth - Ontario Storms Site! Updated or ended by 10:44 p.m. EDT. At 10 PM EDT, Environment Canada meteorologists are tracking a severe thunderstorm that is possibly producing a tornado. It will be passing Seaforth by 10:15 PM and may reach Brodhagen by 10:30 PM. This is a dangerous and potentially life-threatening situation. Take cover immediately, if threatening weather approaches. 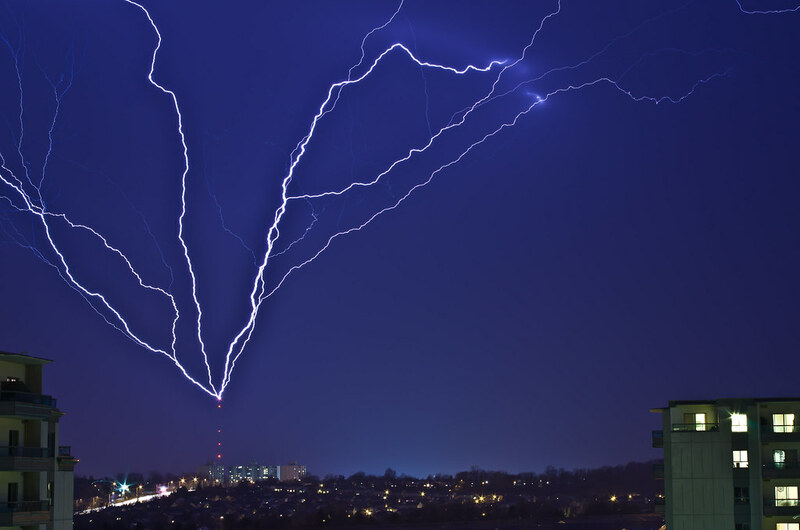 Tornadoes at night cannot be seen and may strike suddenly. Sometimes they are preceded by strengthening winds, large hail, or an approaching whistling or roaring sound. Updated or ended by 10:59 p.m. EDT. At 9:40 PM EDT, Environment Canada meteorologists are tracking a severe thunderstorm near Goderich moving eastwards at around 60 km/h. It is moving to areas near Cranbrook in the 30 minutes. It is capable of producing very strong wind gusts, large hail, heavy rain and intense lightning. Take cover immediately, if threatening weather approaches. Strong wind gusts can toss loose objects, damage weak buildings, break branches off trees and overturn large vehicles. Remember, severe thunderstorms can produce tornadoes. 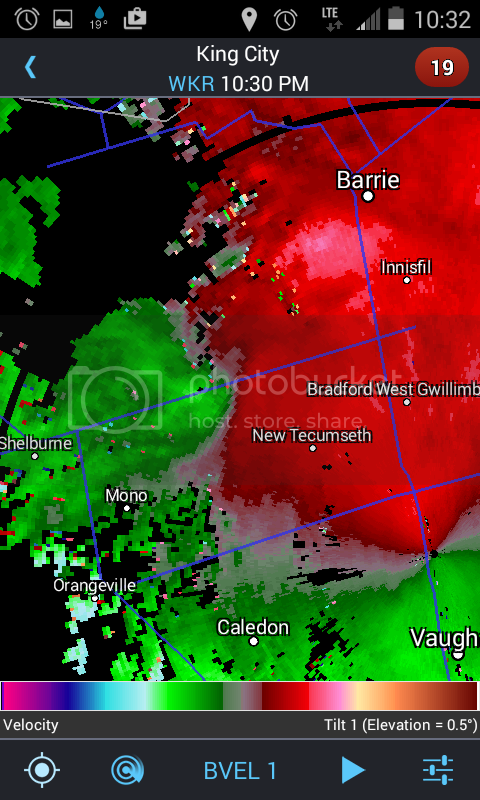 There's also a very clear rotation signature on the storm heading to barrie. Surprised it hasn't been tornado warned yet. Last edited by tice23; 06-22-2015 at 10:20 PM. things are getting intense in south Barrie now....love it! 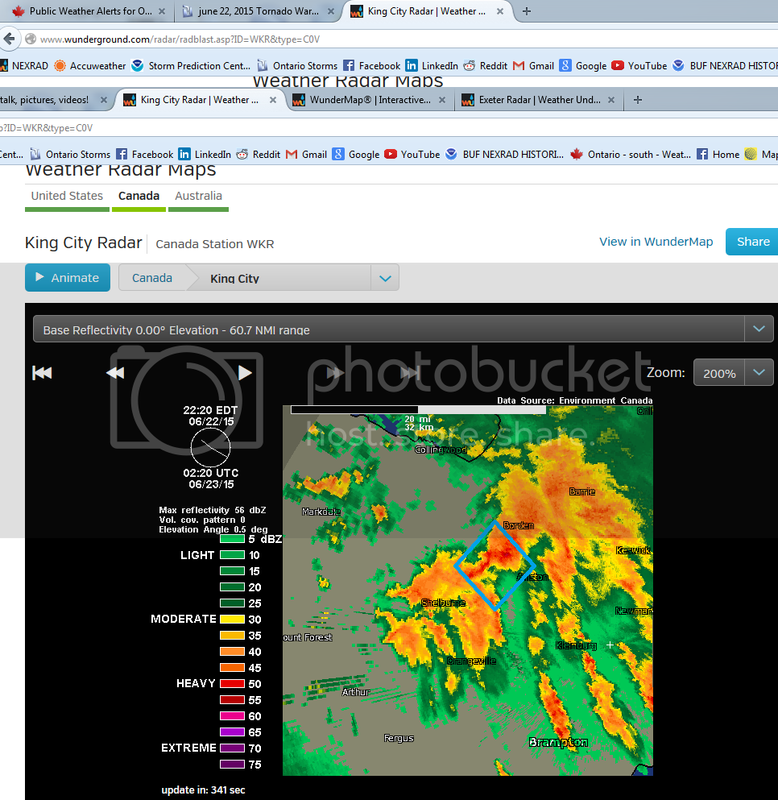 it looks super rain wrapped now but 15 minutes ago was a pretty clear slot leading into the center. this was the storm a few minutes earlier, sorry for the window in window. mashing buttons and about to head out to run some errands. Hopefully EC can get out there to confirm all their tornado warnings today! At 4:55 P.M. EDT Tuesday 23 June 2015.
rounds of thunderstorms blasting eastward across Southern Ontario. Hour or less and wind gusts of 60 to 80 km/h in many areas. amounts of 30 millimetres or more are found in the tables below. The grand river conservation authority as of 10:00 AM Tuesday.